This week sees the start of Hertfordshire's Walk to School campaign, to encourage children to walk to school from now until Clean Air Day on 21st June 2018. 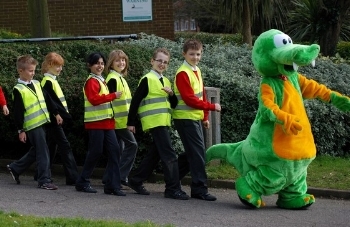 Buster, Hertfordshire’s amazing Stepasauraus is walking across the Earth to encourage active travel and cleaner air. As well as getting more children to walk, scoot and cycle to school they will also have the educational opportunities to discover more about the planet and the benefits of active travel. For more information contact activeandsafertravel@hertfordshire.gov.uk or call 01992 556803. During the summer we have a host of summer evening walks available across the county to help you make the most of the daylight hours and increase your steps if you work or have other commitments in the day. Register online or just turn up! 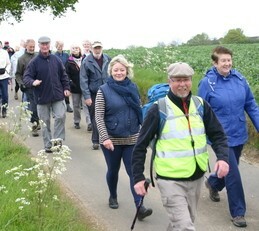 Sign up as a new walker and walk in May and you can claim your Hertfordshire Health Walks goody bag. Inside you'll find a water bottle, step counter, activity tracker and more! Plus if you're already participating in Health Walks, you can claim your bag too, by walking 6 times between May 1st and June 30th. On Monday 14th May to celebrate Walking Month and the Hertfordshire year of Physical Activity 2018 we held our annual Mass health Walk. We offered 37 walks and these were enjoyed by 815 walkers. This beat our existing record of 620. It was great to welcome so many new walkers to the initiative as part of this event, and we hope we can motivate you to continue to walk with us. Follow Health Walks on Facebook to view our photo album from the event. 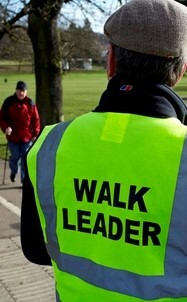 Heartfelt thank yous to our fantastic volunteers to made the event and all our walks possible. For your chance to win £100 HF Holidays vouchers and a FitBit Flex 2 share your favourite Hertfordshire Walking route on the HertsYOPA18 facebook page, so you can inspire others to try your route too. Post a selfie, an explanation of the route or a link to the route or map and at the end of May we'll pick a winner. Good Luck! To take inspiration from our female English athletes at the recent Commonwealth Games, the Herts Sports Partnership are once again promoting 'This Girl Can in Herts' week from Monday 18 to Sunday 24 June 2018. There will be a seven day campaign focusing on women and girls getting active through sport and physical activity, no matter their size, age or ability. The campaign will run with a focus on leadership, inactivity, the social side of sport and confidence, and we would be delighted if you could join our campaign. Could you encourage a friend to participate in their first Health Walk, try a new route or maybe you might look to get trained up as a Health Walk volunteer? The campaign will be very active on social media, and you can get involved by using #TGCinHerts on twitter. Visit the campaign website to find activities happening near you or contact Alex on a.varran2@herts.ac.uk. Meet at Cole Green Station car park off Station Road, Letty Green, SG14 2NL. 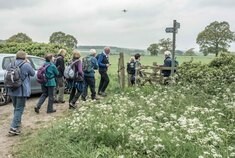 Take an early morning walk with the Countryside Management Service to explore the Cole Green Way and some of the surrounding footpaths, and discover the variety of birdlife that makes its home along the route. We will also talk about the new Greenspace Action Plan for the Cole Green Way. No need to book, just turn up. Meet at the entrance gate to Moor at bottom of Mill Lane, Croxley Green WD3 3EW. Join the Friends of Croxley Common Moor on a leisurely stroll around the moor looking for, and especially listening to, the resident birds which will be singing on territory at this time of year. No need to book, just turn up! Meet at the Causeway Car Park, Abbots Langley, WD5 0AW. See where the soldiers from the village lived, learn about the village at the time of the First World War, hear the Soldiers’ stories and of their exploits. Walk in their foot-steps through the village. There will be a visit to the 1st Abbots Scout Troop Great War Exhibition. Supported by Abbots Langley Local History Society.